WHAT IS WAY OF STRIFE LITERATURE? Way of Strife Encyclopedia of the Bible & "Our Kind Of Christianity"
Distributed by Way of Strife Literature's Parody Service. These articles can be spread around on BBS or Internet sites without express permission from the author. In fact, we would encourage you to do so! Just link back here if ya could, please. This material can be spread on good websites like FreeRepublic.com, but if someone like MAD Magazine wants to use it, they really should hire me first. This is a listing for Christians who are trying to live out the faith being saved by grace, not the legalistic ravings of fundamentalists et al. Our goal is, as everything else a Christian is supposed to do, devotional. However OUR PRIMARY PURPOSE IS TO PROVIDE INFORMATION TO ASSIST CHRISTIANS IN THE BUILDING UP THE KINGDOM OF HEAVEN AGAINST THE TROUBLE THAT CLOUD AND OTHER FUNDAMENTALISTS ARE STIRRING UP IN THEIR APOSTACY. And if it takes parody to do that, so be it! If you desire to receive this type of material on a regular basis, let us know and we'll churn out more! And it won't be implied that you see our ministry as proudly as Cloud sees his that we'll ask you for a donation, either. Way Of Strife Literature was created by a 26-year old Christian who ran afoul of David Cloud's "ministry" and was led by God to rebuke Cloud for his errors. I'm better known on the Internet as "Darth Sidious" and so I'll keep it here: not because I'm concerned of anything legal coming from Cloud (who, being a good Christian, would never sue his brother Christian per Jesus' instruction of course) but because I'm gaining success as a published writer. God has given me a talent and I'm striving to use that to glorify HIM, not myself. I'm not going to do anything to jeopardize that. However, God has also shown me that I can use that same talent to poke fun at a worker of iniquity who commits error in the precious name of Jesus Christ and then hides behind the name of Our Lord as an excuse to continue in his pride and delusion of grandeur. Do I hate David Cloud? Absolutely not! Jesus commanded us to "love one another". Have you ever thought about what that means? We're to love ALL of one another! It has to be a pure love, not one motivated by flesh or pride or desire. We love each other just for the sake of love, just as Jesus loved us enough to die for us. In the three years as of this writing that I've been a Christian, I've come to realize that the love of Jesus Christ, lived out in the daily life of a believer, is the greatest love of all. And it's the love that we should want to extend to everyone we meet in this life so that they, too, can know His love and rejoice in that peace also. We should not want to "love" others just so they join a "fundamentalist independent Baptist church" like, ahem, some people who shall remain nameless apparently do. Christian love is not proud, it is humble. Christian love is not boastful, it is meek. Christian love is not condescending of others, but puts one's self below others in service. Christian love does not judge others: we can and should warn others if they are hurting themselves in sin, but that must come from a loving heart that speaks from earnest humility. Christian love does not point to one's self as a worker, but to Jesus Christ who has finished the work on Calvary. So no, I don't hate Cloud. However, his work should be mocked... and that's why this site is here! For all his ravings against Catholicism, Cloud has set himself up as a "little pope". He misunderstands pastoral authority: in his eyes there are two kinds of believers, the laity and the clergy. To him, church leadership is there for sake of leadership, and not Christ-like example or service. Although he denies it, he is an ardent, uncompromising believer in legalism... something that the apostle Paul warned us against. He slanders other people, then accuses them of slandering him when they take him to task. He cannot live out the Christ-like life because he's too busy pointing out the Christ-less "faults" in others. He has an almost-paranoid loathing of Roman Catholicism. He believes in building up the local church, not in building up and equipping the individual believer to be a witness for Jesus Christ to a world yearning for His love. And all the while, Cloud has perhaps the most arrogant and proud heart behind any "ministry" on the Internet. Jesus told His disciples to not remove the splinter from the eyes of another until they've removed the plank from their own. Cloud doesn't just have a plank, he's got a whole lumber yard blinding him. And it's not just Cloud, but the whole lotta the so-called "fundamentalist" movement. Fundamentalism takes more pride in being apart from the world than it does in belonging to Christ. All of this and more makes David Cloud way past due for a well-deserved spoofing! DARTH SIDIOUS' TESTIMONY AND FAMILY. In 1995 the young man who would someday be known as "Darth Sidious", through a series of circumstances set into motion by God, found himself at a new college somewhere in the southeastern United States. It was here that for the first time in his life he found people living for Jesus Christ, not because they had to but because they wanted to. It was a far cry from the rigid, loveless fundamentalism he had known for all his life and that had driven him from God ten years earlier. He had spent all those years as an atheist, sometimes outright hating the idea that God would exist. But in college, there were people who were letting Christ have a real presence on campus. 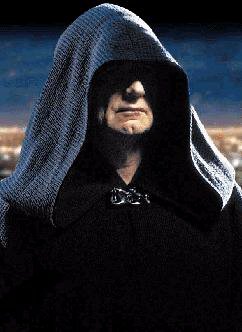 "Darth Sidious" accepted Jesus Christ as his own Lord and Savior in 1996 at age 22. He never says that he was "saved": "I have a relationship with Jesus. I put Him first. He leads me in growth in that relationship. Salvation is just something that's encompassed by that, but it is NOT the reason I came to Christ in repentance. I realized that He was Someone I needed because, on my own, I was insufficient to live the life I knew God wanted for me. Do I have salvation? Of course! But I have a relationship with Christ, which is even BETTER!" At present, "Darth Sidious" is single, has a Mom and Dad that he thanks God every day for their love and support, one sister, and more people than he can readily count that God put in his life who readily showed him Christ's love and forgiveness. He counts every person with that presence of Christ in their heart as a brother or sister in Christ. THE FOUNDING OF WAY OF STRIFE LITERATURE. In 1997, after becoming a Christian, Darth Sidious was directed to the "Way of Life" website. In his seeking out Christian instruction from others, including those on the Internet, it became apparent that Cloud's message was one of the most-cited and most-used... which is a real tragedy because Cloud's is anything BUT the Christian message. His is extreme even for fundamentalism: an unforgiving expectation about an all-forgiving God. On numerous occassions I wrote to Cloud, always praying first and then letting the words flow out as God put them on my heart. Always, he turned them aside, pointing to his own unflinchingly hardened heart as an authority above that of Christian humbleness. Do I claim humbleness also? No, I don't, but I do admit times of pride in my walk with Christ. It's something that every Christian struggles with. Sadly, Cloud sees his "salvation" (if it's even really there) as proof of his "righteousness" and as carte blanche to write as he sees fit... humbleness be damned! Why do I question his sincere salvation? Because I have a very hard time seeing his words bearing the fruit of the spirit. By his own admission, he doesn't even want his work to be devotional to Christ... instead it's devotional to what can only be called a man-made and man-sustained institution: the local church, for the local church. To his credit, Cloud does make some good points on a few things. He is admirably against ecumenicalism in a time when Christians should recognize the danger of gathering believers under man instead of under God. Sadly, he negates his warning against ecumenicalism by his promotion of unbiblical "pastoral authority": letting a "pastor" have rule over a congregation instead of the believer being his or her own priest (one of the tenets of New Testament Christianity and the Reformation). In a perfect world, all pastors would guide their congregants with a servant's heart. Cloud's insistence upon his model, however, can only lead to abuse by pastors of the power given them. What's more, nowhere in the New Testament was a church described as having one titular leader. Instead there were church "elders" by one name or another that guided a local church. Cloud doesn't leave any room for that, so blinded by power is he. Three things in particular had God leading me to take a stand against one of the Internet's biggest false-witnesses. The first was Cloud's un-scriptural insistence that the King James Bible, and only the King James Bible, be used by Christians. Of course, there are some Bibles that have been written for man's sake and not God's, but Cloud has misled countless people with the lie that the New International Version, the New Revised Standard Version, and others are "tools of the devil". "Textus Receptus" is a made-up doctrine: yes, God's Word shall never pass away... but are we to believe that another man's interpretation of that word is supposed to be infallible? Cloud leaves nothing for the individual heart seeking after Christ: it's either his way or none at all. Cloud (and others) are confusing the Word for the words. They don't want to admit that God can and does work through the NIV as much as He can through the KJV. The second thing was his accusation that someone I happen to know is part of the "ecumenical conspiracy" Cloud madly envisions. If given a choice between who was the more credible "conspiracy theorist", Joe McCarthy or David Cloud, pick McCarthy: history has borne Joe out, while Cloud's shoddy research wouldn't give him passing grade on a high school term paper. Cloud doesn't see anything wrong with blanket accusations against people. In fact, he scours without rest until he finds more: to date he has accused Billy Graham, the Promise Keepers, Dr. James Dobson, Bob Jones University, Mother Teresa, any and every Christian musician that doesn't play "old" stuff, everyone Catholic, everyone Methodist, everyone who's any other denomination other than his brand of "fundamental independent Baptist", all Pentecostals/Charismatic, etc. as belonging to Satan and his minion the Antichrist (in Cloud's mindset, this happens to be whichever pope is in the Vatican at present). It's as if the more people Cloud slanders, the more he's trying to be perceived as credible. He's like Oliver Jones from the classic "Bloom County" strip: the louder he yells, the more believable he thinks he is. But that doesn't give him a license to slander people without reason. Cloud has plenty of slander, and little reason... or none at all. He should be ridiculed for such. And so, Way Of Strife Literature was born. Our purpose is that, every time David Cloud publishes something on his page that requires countenance, we will counter it (notice how I say "we" and "our" just as Cloud says "we" and "our". He's just one man, not a whole staff. If "they" can say it, so can "we"!) We will respond with reason, with dignity, and most of all, with prayer. We aren't here to create strife: our name is really about what Cloud's ministry is all about... making strife and division and trying to get away with it. Well, we aren't going to let him. We are here to demonstrate that you can serve Christ with boldness and humility... both of which I will do my best to strive for in serving Him.